Farm pick up is available upon appointment. For larger wholesale local orders, we are willing to deliver free of charge to help keep our prices low and your margins higher. We ship USPS unless specified otherwise. Have Cold Feet? Want to Feel Better? A warm and exceptionally soft sock with less restrictive ribbing around the ankle to help promote blood flow circulation. Therapeutic Alpaca Socks are specifically designed for those with cold and aching feet, both indoors and outdoors. Great for those who do not want a restrictive feel around their lower legs, especially for diabetics, Neuropathy and Rheumatoid arthritis. 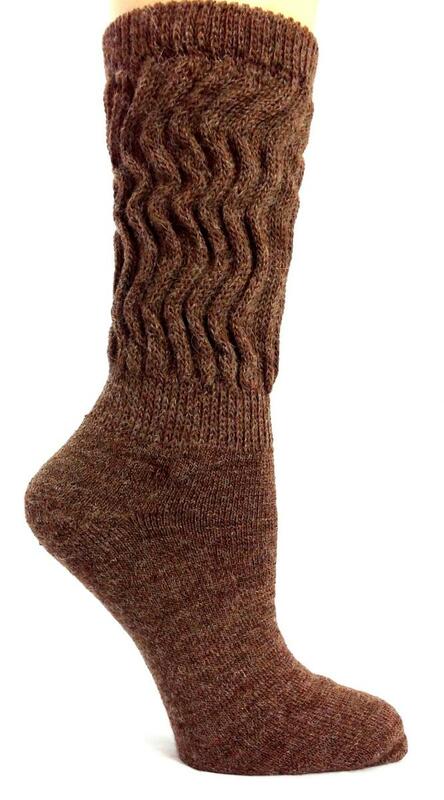 Enjoy the comfort of a ribbed sock combined with the warmth of alpaca. The socks are offered in mid-calf and over-the-calf styles. 43% alpaca /43% acrylic /8% nylon /6% elastic. Autumn is in the air with its golden trees, the rustle of leaves under your feet, the muted singing of birds. But this beauty of the fall often comes with a cloudy sky, rains and a breakdown. Sunny days are getting shorter, and our body stops producing vitamin D that is the most important element of our health and mood. Nov 1, 2017 04:00 AM Read more..
We are an alpaca farm in Bozeman Montana with 150 alpaca, depending on the day. We have 10+ years of experience raising, selling and breeding alpacas. We create thousands of hand crafted alpaca products including hats, socks, blankets and scarves every year from local knitters, crocheters and weavers. We sell 20-30 alpacas yearly and compost alpaca manure into rich fertilizer. We are a fully vertically intergated alpaca farm and love raising alpacas as a full time business.